Home of the 2004 state Little League baseball and softball tournaments. Canton's Carli Atkinson and Granby's Ashley Bascetta vye for the loose ball in the Class S championship game at Trinity. HARTFORD, Nov. 20, 2004 – Nineteen years ago, an underdog Canton High field hockey team staged a miracle of sorts battling heavily favored Granby to a 0-0 tie in double overtime and a share of the Class S championship. It was the first of eight state titles that Canton would claim under the reign of coach Nancy Grace. In the final game of Grace’s coaching career, Canton (15-2-3) was in the final again against top-seeded Granby. But this time, there would be no sharing, no miracle finish for the Warriors. Granby senior Ashley Bascetta scored a goal and had an assist to lift Granby to a 3-1 win at Trinity College and its second straight Class S championship. 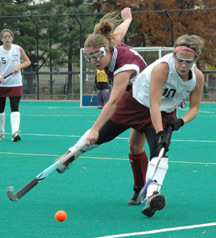 Granby (17-1-2) became the first state school to win nine field hockey state titles. Bascetta carried the ball 25 yards into the circle and gave Granby a 2-0 lead midway through the first half. With Canton desperately trying to mount a comeback in the second half, Bascetta took over again. On a drive into the Warrior circle, she drew the defense to here before firing over a perfect pass to a wide-open Rebecca Gamble at the far post, who tapped in the ball for the back-breaking score with 16:27 left in the game. SEATTLE, Oct. 12, 2004 – As Connecticut fans have seen in the past, Sue Bird knows how to win championships. It wasn’t a thrilling end-to-end run for a game-winning layup like she scored to lift UConn over Notre Dame in the Big East Tournament final. But it was enough to get her Seattle Storm on the road to a championship. Bird scored all eight of her points in the first 4:02 of the second half as Seattle expanded a one-point halftime lead to nine points. It was enough to ignite a Storm surge as Seattle won its first WNBA championship with a 74-60 victory at a loud 17,072 at Key Arena. Seattle captured the best-of-3 series by a 2-1 margin. Connecticut, with its five rookies including point guard Lindsay Whalen, never led but they tied the score twice in the final 3:11 of the first half. They erased a 12-point deficit with some outstanding inside play from Ashja Jones (12 points). The Sun used a 13-2 run to climb back into the game while Seattle was on a 0-for-11 drought. Connecticut trailed by just one at the half, 37-36. But Seattle went 6-for-6 from the floor to open the second half to establish a nine-point lead. Connecticut cut the lead to five when Katie Douglas stole the ball and fed Nykesha Sales, who was fouled. Sales hit both foul shots to cut the lead to 51-46. But Seattle held Connecticut without a field goal for the next eight minutes (0-12) to pull away. Series MVP Betty Lennox led Seattle with 23 points while Lauren Jackson added 13 points. Sales had 18 points for the Sun while Jones added 12. Douglas had a horrific shooting day, going 0-for-11 from the floor but she had six points. UNCASVILLE, Oct. 8, 2004 – Rookie Lindsay Whalen gave Katie Douglas the ball and the veteran buried the Storm in game one of the WNBA finals. Douglas had 18 points as she hit 6-of-11 shots from the floor including three 3-point goals to lead the Sun to a 68-64 win over a rowdy crowd at the Mohegan Sun Arena. Whalen finished with 11 points but she set a franchise playoff record with nine assists along with two steals and only two turnovers. Not only did Douglas excel offensively but she helped stop UConn legend Sue Bird, who had 12 points for visiting Seattle along with four assists and five turnovers. Wendy Palmer added 16 points and seven rebounds while Taj McWilliams-Franklin scored 10. Seattle’s Lauren Jackson had 16 points while guard Betty Lennox had 17 points. McWilliams-Franklin and Palmer helped limit touches for Jackson, who was named to the All-WNBA first team Friday. “It doesn’t matter because the next game I’m going off,” Jackson told The Hartford Courant. Jackson led the WNBA in scoring this year. "Their defense took us out of what we wanted to do," Seattle coach Anne Donovan said. "I thought they set the tone. We didn't respond until very late in the game.” Connecticut shot 45.9 percent from the floor while Seattle shot only 35.1 percent. The Sun outscored Seattle in the lane, 34-26, led by Palmer. Connecticut had a WNBA Finals-record 15 blocks and six steals. "She didn't have not single coverage or double coverage, she had two or three people swarming at her," Donovan said. "But other people need to step up. We can't be all about Lauren Jackson." The Sun are one win shy of its first WNBA championship. Game two is Sunday at 7 p.m. in Seattle on ESPN2. Game 3, if necessary, will be Tuesday night at 9 p.m. on ESPN2. UNCASVILLE, Oct. 2, 2004 – The first lead came with 48 seconds remaining. In those final seconds, the Connecticut Sun secured their first championship banner. Once a team known for folding when the going got tough, the Sun outlasted the Liberty, 60-57 to sweep the WNBA’s Eastern Conference finals and earn a spot in the WNBA championship series. Down by two, rookie Lindsay Whalen’s left-handed layup tied the score at 54. The Sun took their first lead when veteran Taj McWilliams-Franklin converted one of two free throws. New York’s Elena Baranova missed on a three-point shot with 27 seconds left and Katie Douglas added two more free throws for a 57-54 lead. The win lifts Connecticut into the finals for the first time in franchise history. McWilliams-Franklin, one of two players who have been with this franchise since its inception in 1999 as the Orlando Miracle, had 18 points. "I've been coaching for 30 plus years and this was one of the most emotional days of my career," Sun coach Mike Thibault said. "This is very emotional for our team. There's something about this team that finds a way to win. I feel happiest for the veterans. It means a lot to them. We were down five or six points but we found a way." Douglas scored 14 for Connecticut with four assist. Sales and Whalen each added 11 points. The Sun swept the best-of-3 series, 2-0 after they whipped New York, 61-51 in game one. "We just had to stick together and gut it out, and we were able to do it," Whalen said. "This was definitely a gut-check game." NEW YORK, Oct. 1 – The Sun’s knockout punches are getting pretty good. For the third straight game, Connecticut seized control of a WNBA playoff game in the first half and didn’t let go. Nykesha Sales and Lindsay Whalen fueled a 17-2 run as the Sun took over in a 61-51 victory in game 1 of the Eastern Conference finals at Madison Square Garden. The victory leaves Connecticut one win shy of its first berth in the WNBA finals. Sales and Whalen combined to score 27 points in the first half. Sales finished with 15 points while Whalen added 12. Taj McWilliams-Franklin added 14 points and 10 rebounds as the Sun held a commanding edge on the glass (39-25). Wendy Palmer had no points but she also yanked down 10 rebounds. Katie Douglas added another 10 points. The Sun set a new franchise record by allowing only 17 points in the first half. They led 29-17 at the break. Game two is Sunday in Connecticut at noon. UNCASVILLE, Conn., Sept. 29, 2004 -- And the rookie shall lead them. Connecticut’s first-year guard Lindsay Whalen had 17 points and six assists to lead the Sun in the Eastern Conference finals with a 76-56 win over Washington in the decisive game 3 Wednesday. Whalen turned the game around with her penetration moves in the first half. She sparked the Sun to a 25-5 surge over an eight-minute stretch in the first half, scoring seven straight points. She scored on three straight possessions driving to the basket. Once the Mystics began to collapse on her, she found her teammates. She hit Wendy Palmer-Davis in the low post for two points and wide-open Nykesha Sales who gave Connecticut a 14-point lead with a three-point shot. Washington’s rookie guard Alana Beard tried valiantly to carry the torch herself. She had a game-high 22 points, four steals and four blocked shots. She had 10 of Washington’s first 14 points in the second half. But the help wasn’t there. Chasity Melvin had 12 points and nine rebounds. The Mystics were outrebounded 36-31 and gave up 18 second-chance points to the Sun. Whalen had 11 of her 17 points in the first half while Sales had 16 of her team-high 18 points in the first 20 minutes. Taj McWilliams-Franklin had a game-high 11 rebounds. The Sun, which had 19 assists, advance to face the New York Liberty in the Eastern Conference final Friday. UNCASVILLE, Conn., Sept. 27, 2004 – The Washington Mystics took an early blow to the body in game 2 of the WNBA Eastern Conference semifinals Monday and never recovered. The Connecticut Sun sank five of its first six shots before the Mystics scored a point and built a staggering 16-point lead in the first 4:30 on the way to a 80-70 victory. Sun guard Lindsay Whalen led all scorers with 21 points including a 15-for-16 performance at the free throw line. Nykesha Sales added 13 points and an WNBA-record 7 steals while Wendy Palmer-Daniel and former Mystic Asjha Jones had 12 points each. Before the game, Palmer-Daniel was named as co-winner of the WNBA's Most Improved Player award with Indiana's Kelly Miller. UNCASVILLE, Conn., Sept. 19, 2004 – The Sun may just be a nice fit for the Nutmeg State. In a state where basketball championships are treasured and expected, Connecticut took its first step toward establishing its own championship identity Sunday with a 80-60 win over the Indiana Fever in the final regular season contest of the 2004 WNBA campaign. The win gave the Sun (18-16) its first Eastern Conference championship in franchise history and gave Connecticut the No. 1 seed in the East when the WNBA playoffs begin on Friday. It’s not the pennant that the Sun crave the most but it is a start for the franchise that only won its first playoff series a year ago. Ashja Jones came off the bench to score 16 points while Nykesha Sales added 14 and Katie Douglas 13. Olympian Tamika Catchings had 30 for the Fever but the Sun didn’t allow anyone else to help. Deanna Jackson added seven for Indiana. The Connecticut bench scored 35 points and helped break open the game midway through the second half with Jones, Le’Coe Willingham and Debbie Black helping spark a 13-2 surge. The Sun’s semifinal opponent will be determined later today along with its playoff schedule. A crowd of 8,132 filled the Mohegan Sun Arena for the regular season finale. UNCASVILLE, Conn., Sept. 17, 2004 -- The Sun will have to wait another night to capture the team’s first Eastern Conference pennant. Crystal Robinson scored 22 points and four 3-point goals as New York clinched a playoff spot with its second win in two nights with a 69-66 win at the Mohegan Sun Arena. The Liberty drained seven 3-point goals in the second half frustrating Sun coach Mike Thibault and Connecticut. New York shot 61 percent (16-of-26) in the second half. Connecticut closed to within one, 67-66 with 15 seconds left but New York’s Elena Baranova blocked a shot attempt from Taj McWilliams-Franklin (14 points) to ice the victory. Lindsay Whalen had 16 points for Connecticut, which closes out the regular season hosting Indiana Sunday at noon. EAST HARTFORD, Aug. 1, 2004 – The women are ready. The U.S. Olympic women’s soccer team completed its training run for the Athens Olympics with a spirited 3-1 victory over China before over 15,000 fans at Rentschler Field Sunday. Veteran Mia Hamm had a goal and two assists while 5-foot-10 youngster Abby Wambach had a goal and assist on a humid afternoon. “I felt like I had lava flowing out of my head,” American forward Julie Foudy said. The Americans finished their six-month preparation for the Olympics with a 15-1-2 mark. State native Kristine Lilly had an exceptional game at midfield, helping the Americans to a 20-6 advantage in shots and a 10-6 advantage in shots on goal. HARTFORD, July 27 – Connecticut native Kristine Lilly and her U.S. Olympic women’s soccer teammates make one last stop before heading over the 2004 Athens Olympics when they host gold medal rival China at Rentschler Field in East Hartford on Saturday at 3 p.m., televised nationally on ESPN2. It is the first appearance by Lilly and her U.S. teammates in the state since a warm, sunny June afternoon in 1997 when they beat Canada at Willow Brook Park in New Britain. But China will be a far tougher foe. While the U.S. is 14-1-2 this year, China has beaten the Americans eight times and is a gold medal favorite along with the U.S. The Americans will have a mixture of young and veteran players, some of whom are winding down their careers. Lilly will making her record 276th appearance. HARTFORD, April 18, 2004 -- Order those new signs for Storrs. It's now Titletown. Thousands of UConn fans celebrated in Hartford for the NCAA champion UConn men's and women's basketball teams. The men won the second championship in school history with a dominant performance over Georgia Tech led by Emeka Okafor and Ben Gordon. The UConn women captured a record-tying third straight championship less than 24 hours later as Diana Taurasi and Barbara Turner led the Huskies past Tennessee. One state. Two national champions. A reason to be proud and celebrate. SAN ANTONIO, Texas, April 3 -- Fourteen years ago, Duke's Christian Lattener broke the hearts of the Huskies and their fans with his last-second jump shot that kept UConn from the 1990 NCAA Final Four as the Blue Devils won the Eastern Regional final. In 1999, UConn got the ultimate revenge but beating the favored Blue Devils for the NCAA championship. But on Saturday night at the Alamo Dome in San Antonio, it got even better. Fighting with the desperation of a team at the edge of oblivion, the Huskies erased an 11-point deficit and outscored Duke 12-3 in the final 3:28 to beat Duke, 79-78 and earn its second berth in the NCAA championship game on Monday against Georgia Tech. Junior Emeka Okafor missed nearly the entire first half after picking up two fouls in four minutes but he had 18 points in the second half including several huge plays in the final 3:28. His baseline jumper over Nick Horvath with 1:18 left cut the Duke lead to one, 75-74. After Duke missed a three-point shot, the Okafor's short jumper bounced off the rim but freshman Josh Boone (9 pts., game-high 14 rebounds) tipped the rebound to Okafor, who grabbed it and went back to the hoop and scoring for a 76-75 lead with 25 seconds left. With 12 seconds left, Okafor stripped Duke's J.J. Redick who was driving to the lane. Rash Anderson sank two foul shots for a 78-75 lead. "We just kept believing in ourselves," UConn coach Jim Calhoun said. "It got really tough for out there and it took 10 or 15 minutes for us to get our toughness back. But once we did, we were pretty good. Sometimes you have to take the last breath out of a team (Duke). We were able to do that with some great plays and some great, great defense." UConn plays Georgia Tech, a team that beat the Huskies easily by 16 points in November in the semifinals of the preseason NIT. The UConn women play Minnesota in the semifinals on Sunday. BRIDGEPORT, March 8 -- Another major league franchise is leaving Connecticut. While not as well known as other sports, Major League Lacrosse features the best outdoor lacrosse players in the world and MLL is moving its Bridgeport team to Philadelphia. MLL wants to get its teams out of vast baseball stadiums and into more intimate settings that will hopefully translate into better TV ratings. Bridgeport, a charter member of the MLL, played three years at Harbor Yards and never made the playoffs. UNCASVILLE, Jan. 28, 2004 -- The Sun advanced to the Eastern Conference finals last August but the changes continue in the off-season. The Sun has reached an agreement in principle to trade All-Star guard Shannon "Pee-Wee" Johnson to San Antonio for a pair of draft picks. Connecticut will ship Johnson and its second and third round selections (No. 21 and No. 34) to the Silver Stars and will receive San Antonio's 4th, 16th and 29th picks in the upcoming WNBA draft. "This move gives us an opportunity to be a major player in one of the deepest drafts in WNBA history," Connecticut coach Mike Thibault said. "We have three of the top 16 picks, and there is a lot of talent in the collegiate ranks. I appreciate everything Pee Wee did to make our first season a big success, but she obviously also has a high market value. That value allows us to make a move that will help us take a major step toward improving our team." A four-time WNBA All Star, Johnson averaged 12.4 points, 5.76 assists and 3.9 rebounds per game in 34 starts during the regular season for the Sun. Johnson has been with the franchise since its founding as the Orlando Miracle in 1999. "We know that if we are to attain our goal of winning a WNBA title, we must get better," Sun General Manager Chris Sienko said. Johnson spent the winter playing in Russia.